If there is one director that helped define the classic western more than any other, it would be John Ford. 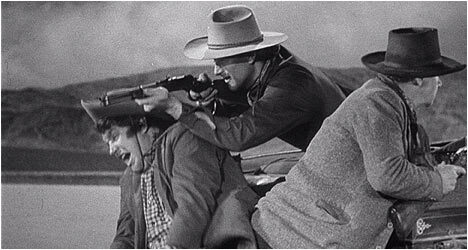 With Stagecoach (1939), he took B-film material and elevated it to A-list status. In doing so, Ford established a benchmark that other films of the genre would be measured against for years to come. However, at the time, he was trying to get his film made, he had a spotty commercial track record and couldn’t convince studio boss David O. Selznick to bankroll his adaptation of Ernest Haycox’s short story “Stage to Lordsburg.” So, Ford bought the story with his own money and brought the project to Walter Wanger at United Artists. Stagecoach would also mark the beginning of an important relationship between Ford and actor John Wayne. The filmmaker had used the actor before as an extra but with this film Wayne would make the transition from B-movie obscurity to iconic leading man status. We meet a group of passengers making a dangerous journey to Lordsburg on a stagecoach. Dallas (Trevor) is a beautiful prostitute escaping the conservative elements of the town. Peacock (Meek) is a mild-mannered liquor distributor which instantly endears him to Doc Boone (Mitchell), the town drunk. Lucy Mallory (Platt) is pregnant and looking for a fresh start. Hatfield (Carradine) is a slick, shifty-looking gambler. Driving the stagecoach is Buck (Devine), the comic relief complete with a voice that cracks, and Curley (Bancroft), the lawman who rides shotgun. Along for the ride is Gatewood, the unscrupulous banker, and the Ringo Kid (Wayne), an outlaw who has escaped jail in order to find the men responsible for the death of his father and brother. At the beginning of the trip they are warned of the increasing threat of Apaches and, at one point, even vote on whether to press on or turn around once they lose their U.S. Calvary support. Ford does a nice job introducing all of the characters while Dudley Nichols’ screenplay, coupled with the talented cast, does just enough to flesh out the characters beyond their stereotypes. Shot in Monument Valley, Ford uses the vastness of this foreboding terrain to really open things up and provide the genre with one of its most iconic settings. However, the Apache are presented as a one-dimensional threat, fulfilling the genre convention as the anonymous enemy. One of the film’s highlights is the Apache raid on the stagecoach as our heroes fight for their lives and features an impressive stunt involving a man being dragged underneath the stagecoach that would be recreated in Raiders of the Lost Ark (1981) albeit with a truck. Stagecoach is one of the finest examples of the classic western as it presents all of the tried and true conventions of the genre and gives them a mythological status. This special edition is jam-packed with goodies for fans of the film and of the western genre, starting off with an audio commentary on the first disc by film historian and western scholar Jim Kitses. He challenges the conventional view that Stagecoach lacks the depth and command of craft of Ford’s later films. Kitses does a fantastic job of explaining how Ford’s camerawork and the use of invisible editing set up differences in class and established genre conventions. When not offering expert analysis, he provides biographical information on various cast members in this eloquent and informative track. Also included on this disc is a trailer. Disc two starts off with “Bucking Broadway,” a 54-minute silent film from 1917 that stars John Ford favourite Harry Carey as a cowboy whose true love is taken away by a big city type. It features many of the themes and conventions that Ford would explore again and again in later films. There is a 1968 interview with Ford by British journalist and television presenter Philip Jenkinson. Running over an hour, the filmmaker talks about his childhood, how he got his start as a director, working with John Wayne, and, of course, Stagecoach. Ford comes across as a no-nonsense man and plain-spoken, refusing to romanticize his past despite the interviewer’s best attempts. Filmmaker Peter Bogdanovich offers his thoughts on Stagecoach and praises the strong script and solid ensemble cast. He analyzes Wayne’s performance and how he reacts to the things that happen around him. Bogdanovich also offers his impressions of Ford and Wayne, having met both of them. “Dreaming of Jeanie” is a video essay that examines Ford’s visual style in Stagecoach. It analyzes several of the film’s themes through clips and illustrates how Ford used camera movement, framing and background details to show the traits of the various characters. “John Ford Home Movies” is an interview with the director’s grandson and biographer Dan Ford. He talks about his grandfather’s home movies that show the man at his most relaxed, complete with clips from the actual films. We see the likes of John Wayne and Henry Fonda lounging around with Ford on his boat. “True West” is an unexpected treat featuring author Buzz Bissinger talking about the 1920s trading post operator Harry Goulding and his role in telling filmmakers like Ford about Monument Valley. The land belonged to the Navajos but he staked out a claim thanks to his friendship with them. Bissinger talks about how Goulding met Ford and persuaded him to make Stagecoach in Monument Valley. Another outstanding extra is a featurette about legendary stuntman Yakima Canutt who performed many of the amazing stunts in the film. He went on to become an important figure in the stuntman industry. Fellow industry legend Vic Armstrong offers his thoughts and impressions of the man and talks about just how groundbreaking Canutt was back in the day. Finally, there is “Screen Director’s Playhouse,” a radio adaptation of Stagecoach that aired on January 9, 1949 and starred John Wayne and Claire Trevor, reprising their film roles.